With Christmas now only a few days away, I decided to get into the festive mood by creating a fun Christmas mani. After watching this video from Bubz Beauty, I decided that her santa hat nail art would be the perfect design. 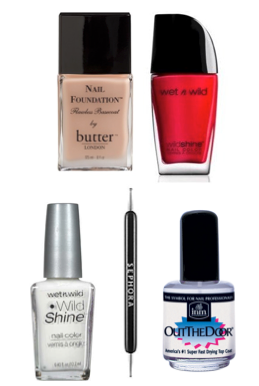 I started with a base coat, Butter London Nail Foundation, and finished with a top coat, INM Out The Door. For the red hat, I used Wet n Wild's new (releasing in Feb 2015) Wild Shine nail polish in Red Red with their old Wild Shine polish in French White Crème for the fur. I also used my dotting tool from Sephora to create the V shape and the white fur. Note: Wait a few hours to apply top coat, and try not to drag the brush against your red and white paint. If you drag the brush bristles, the paint will smudge. Use a decent amount of top coat and be fast with your brush strokes.